This is the removal of broken rock or ore, before work starts on taking the next round advance. The current approach is using a front-end loader, a Load-HaulDump (LHD) unit to dig into the pile of rock, fill the bucket, retreat and perform a 3-point turn and drive forward to dump into a truck or another location. The process is repeated until all the rock is removed. The implications of this process is two-fold: the pile of rock is untouched 80%-90% of the total cycle time during transport of each load; need to excavate short tunnels perpendicular to the main tunnel to allow the LHD to turn around, adding about 15% of extra tunnel length and increased costs. A continuous mucking system (CMS) for rock removal will contribute to increased advance rates by reducing the time taken to remove the broken rock from the face, allowing the face advance equipment to return to the face. 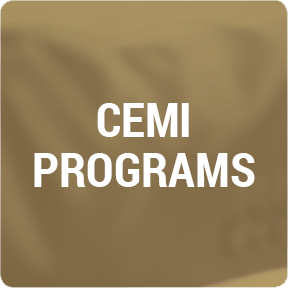 CEMI is currently considering the simulations and cost-analysis of this equipment necessary to fully understand all the implications and complexities of its use. Cemented hydraulic tailings have been the preferred means of backfilling in underground metal mining operations for decades, with many Northern Ontario mines already invested in the hydraulic backfill system. With the onset of bulk mining methods and open stoping, the cement content had to be increased to significant levels to ensure stability of free-standing stope walls (at least 60m high). The result was a significant increase in cost from preparation for filling, from materials and labour to build fill barricades, installation of drainage towers, and increased pour times to ensure sufficient time for the transportation water to drain. This all contributed to constraining the backfill rate and increasing the stope cycle time. Paste tailings backfill have been used since the 1990s, which use a higher percentage of fines to retain the water and prevent separation of solids and water. The advantage of the tailings paste process is that it is a tightly controlled mix design, which allows for a designed performance of the fill, and the lower porosity of the material means less cement for a given in-situ design strength. The benefit of tailings paste fill is a higher reliability of backfill product placed, with designed performance characteristics and a reduction in stope cycle time. 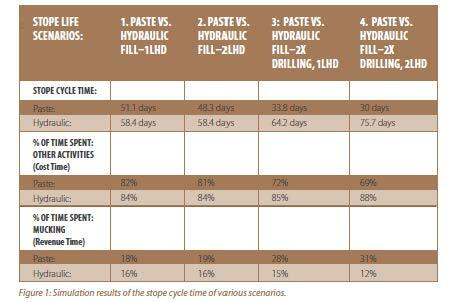 CEMI employed Labreque Technologies Inc. to perform simulations of a standard, bulk open-stoping with-fill production system and compare the stope cycle time for hydraulic fill and for paste fill (Figure 1). The cost of a paste fill plant has a higher capital cost, but it is important to understand all aspects of the cost including: input costs (cement), impact of higher strength, decrease in stope cycle time, impact on production and operating costs. The findings show that by introducing paste fill, it is possible to increase production rate by 40-50%, in Scenario 3 & 4. In contrast, the same scenarios increase the stope cycle time due to the increase in the number and duration of the delays related to preparing stopes for backfilling with hydraulic fill. Actual mucking time can be defined as time generating revenues (revenue time), while the time for other activities is considered time absorbing costs (cost time). Scenarios 1, 2 & 3 indicate mucking at 16% for hydraulic system, regardless of the number of LHDs or the amount of drilling; and dropping to 12% for Scenario 4 because of the delays for fill preparation. For the paste fill system, mucking time increases in Scenario 3 & 4, and the increased amount of drilling allows the amount of mucking to increase by about 30%. Mine production is constrained by the backfill rate. Since the overall fill rate of paste is faster than hydraulic fill, there is an opportunity to increase the production rate. Overall, the simulation results show that a superior, backfill system, with the correct mix design can significantly increase the amount of production or reduce the cost of a given production rate. Significantly, with the hydraulic backfill system, production is limited regardless of what additional equipment is brought to bear and production cannot be increased.